23 Jan 2019 --- SynTech Nutrition, a sports supplement company based in Belgium, will be bringing its “Elite Series” of supplements to the US this year. The sports range aims for complete transparency through the use of clear labeling and scientifically substantiated, active ingredients. The supplement range fills a gap in the US market, Wigman tells NutritionInsight, specifically through the use of fully active dosages. “We don’t use hyped ingredients based on ‘promising’ studies, but only ingredients that are proven to work. Proprietary blends cover up how little of each active ingredient is actually used. The result is a cheap supplement that is under-dosed and, therefore, less efficient. SynTech uses only fully active dosages,” he adds. “Consumers need to know what they are consuming and how much of it. Consequently, we indicate this on our product information sheet, website and most importantly, the label,” he adds. Click to EnlargeProXtend A workout drink that can be consumed immediately before, during and right after training. Clear communication with the consumer, via labels, for example, is a key way to promote transparency and gain consumer trust. Despite today’s consumers being more informed about nutrition and ingredient lists in general, it is becoming important for sports nutrition products to be understood by the general public as they cross into the mainstream. Some of the key active ingredients touted by the company and included in some of its supplements are creatine and beta-alanine. The combination of beta-alanine and creatine is more efficient at developing lean muscle mass and burning fat than the effect produced by creatine in its isolated form, notes the company, and it also has positive effects on the explosive and peak power during long physical efforts. A further combination included in some of the supplements is the Double Action NO Matrix which consists of l-arginine alpha-ketoglutarate and l-citrulline malate. The human body converts l-arginine alpha-ketoglutarate into nitrogen, while higher levels of nitrogen increases blood flow to the muscles. This, therefore, accelerates recovery and give consumers the “pump” during and after a workout. Extra nitrogen also means extra muscle growth, a better pump and better recovery, the company explains. Select supplements also combine EGCG (extracted from green tea) with caffeine, which several scientific studies have shown increases fat burning, leads to improvements in body composition and reduces abdominal fat, the company describes. Further active ingredients include testofen fenugreek extract, ashwagandha, rhodiola rosea, avena sativa, saw palmetto, stinging nettle, vitamin B6, selenium and zinc magnesium for a natural testosterone booster. While people interested in fat burning can expect guarana, green tea extract, svetol green coffee bean, forslean coleus forskohlii, dandelion, red pepper and black pepper in a synedrine formulation, Wigman says. “Each ingredient serves a different goal, so when we develop a product, we first look at what the supplement is supposed to do and then we research which ingredients contribute to that. The other way around also happens; we learn about new or improved ingredients and then we see if we can apply it in a new or existing product,” he adds. SynTsize Pump: A pre-workout product which includes high doses of 8 active ingredients and contains 2g BCAAs per serving that maintain amino acid levels during training. 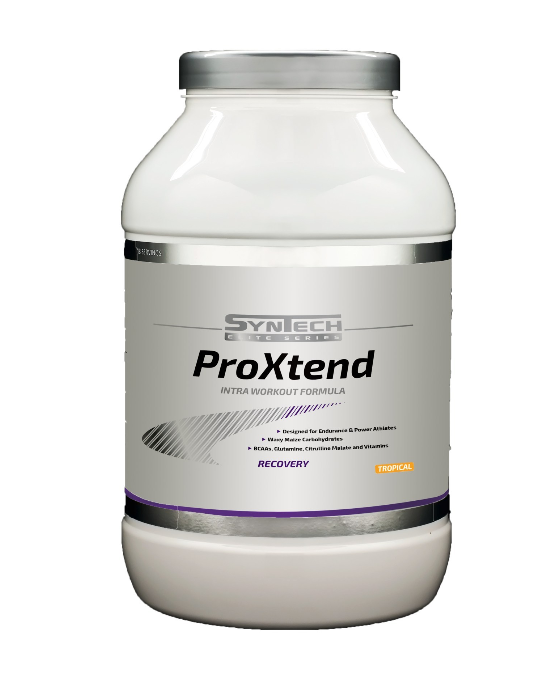 SynTsize Recovery: A post-workout shake that maximizes muscle recovery by increasing glycogen and amino acid levels. ProXtend: A workout drink that can be consumed immediately before, during and right after training. Synedrine: “One of the most advanced fat burners of its kind on the market,” according to the company. Medix Laboratories NV is the parent company of SynTech Nutrition, which distributes its sport supplements throughout Europe, including Sweden, France, the UK and the Netherlands. “Coming to America, the world's largest supplement market, was the logical next step. I believe our products can thrive in the US because of our corporate philosophy of transparency and scientifically formulated high-dosage supplements,” concludes Wigman.